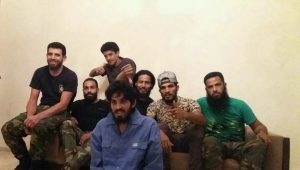 A man said to be one of Ansar Al-Sharia’s top commanders in Benghazi’s Sidi Akhribesh before it finally fell is now in the hands of the Libyan National Army. Ibrahim Bunuwara has appeared in a photo posted online by dressed in blue, beside notorious Saiqa Special Forces commander Mahmoud Warfali, who has repeatedly appeared in apparent execution videos of captives. The most recent one went viral earlier this week. The LNA has meanwhile warned that the last remnants of the Islamist fighters may be wearing suicide vests.